So it’s a New Jersey courts kind of day — or evening, actually — for The Legal Genealogist, as the Central Jersey Genealogical Club wants to hear about early Garden State courts and their records at its meeting at the Hamilton Library tonight. And boy would I ever like to be able to point them to a single online location for these early records. But preparing for this presentation had me surveying the scene and… well… you already know the reality, right? They’re not all online. Not even most of them are online. In fact, it’s pretty dismal for ready online access to records of this type. Oh, it looks promising at first — a catalog search at FamilySearch.org using the keywords “Jersey county court” turns up 524 results.1 But if you then change the availability to online, it drops to 396. That still sounds like a lot of records, until you actually start looking at them. The vast majority of them are probate records — 180 of the 396. Nothing wrong with that, of course: probate records are among the most genealogically useful court records that exist. Then another 35 are guardianships — again, great records, but not the plain old court records we’re looking for. Yet another 34 are land records, mostly related to probate cases: partitions and the like handled by the Surrogate’s or Orphan’s Court. So… what are we to do if we want a wider variety of early New Jersey court records? If, say, in my home county of Middlesex I wanted to see the Commitments and Jail Accounts for 1818-1887? Or the Road Books for 1773-1930? The Manumissions of Slaves between 1800-1825? The Petitions for Peddler’s Licenses and Charity, 1733-1814? Or the Tavern Licenses, 1758-1826? There really is one-stop shopping for all of these — but it’s not online. And that’s true for the vast majority of early New Jersey court records, except for the probate courts. To access these records, we have to get up off our duffs and head to Trenton. Because the one place where these and so many terrific records of early New Jersey courts can be found in a single location is the New Jersey State Archives. Some small fraction of the holdings of the State Archives is online: check out the Imaged Collections (a variety of items ranging from Civil War cartes de visit to 23 images of petitions for shopkeeper licenses in 1781 Middlesex County) and Documentary Treasures (the State Constitutions, images of governors’ oaths of office from 1790 to the present, and the like). • From Atlantic County: Justice of the Peace Dockets, 1822-1949 and Index, 1932-1950 (50 boxes); Record of Grand and Petit Jurors, 1901-1905 (one volume); and Naturalization Records, 1837-1951 (30 microfilm reels). • From Bergen County: Naturalization Records, 1804-1906 and Indexes, 1866-1906 (30 microfilm reels); Petitions for Tavern Licenses, 1786-1866 (35 text items). • From Essex County: Petitions for Tavern Licenses, 1702-1891 (14 boxes or eight microfilm reels); Petitions for Peddler’s Licenses, 1739-1867 (one box); Naturalization Records, 1792-1931, and Indexes 1839-1931 (164 microfilm reels). • From Hunterdon County: Tavern Licenses, Applications and Recognizances, 1738-1894 (10 volumes and 16 boxes); Coroner’s Inquests, 1763-1909 (five microfilm reels). • From Somerset County: Declarations in Debt and other Papers, 1776-1840 (25 boxes); Bail Bonds, 1779-1880 (two boxes); Appeal Papers, 1794-1917 (22 boxes). And that’s just five of New Jersey’s 21 counties — and just a couple of the items available from those. No, it’s not all online. But that doesn’t mean it isn’t out there. 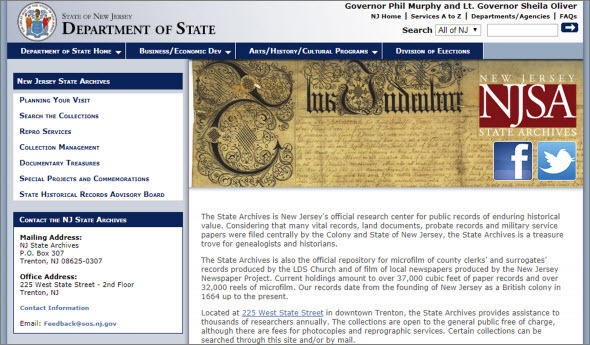 The New Jersey State Archives is a great place to start. I’ve quit looking for Essex Co., New Jersey in the 1750ish time frame. I suspect I have a Loyalist ancestor but I have had zero luck finding any family for him. I’ve settled for some circumstantial papers about other people but it still leaves that doubt in my mind. A trip to New Jersey will not happen to me! So many times, the only way to get a real answer is boots on the ground — you may want to rethink that trip to NJ! It’s nice that these early records are in place. Too bad I have no NJ ancestors. Always, always look for a State Archives website, especially when dealing with events that took place in one of the eastern states with a pre-Revolutionary colonial history. Many of them have online catalogs that will help to identify the collection or collections where the records of interest to you may be found. Even if the documents themselves are not digitized, you may be able to put together eoungh information to enable you to hire someone to get you a copy of a specific document, or to order copies directly from the archives by mail, even if you cannot get there yourself.